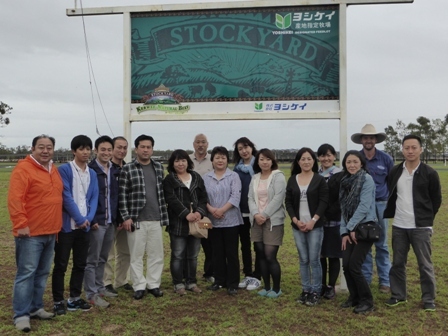 Recently Kerwee played host to a Yokohama based meat importer, as well as staff from a catalogue retailer who deliver chilled ingredients and recipes to consumers all over Japan. The recipes match Stockyard beef products to common Japanese ingredients to produce a range of tasty and nutritious Japanese meals. The range of meals is varied seasonally, with special promotions being featured periodically. The staff visit Australia every year to study our supply chain, understand our quality management programs and ensure that they are familiar with Stockyard products. During this year’s visit, staff from both companies were able to tour Kerwee feedlot and sample our product, as well as having a chance to meet Stockyard and Kerwee staff. Our visitors enjoyed a lavish dinner of Stockyard beef, fresh seafood and some great company. Just another exciting and innovative way in which Stockyard’s products are sold and marketed around the world!